This article is about the astronomical term. For other uses, see Corona (disambiguation). For the city in California, see Corona, California. Spectroscopy measurements indicate strong ionization in the corona and a plasma temperature in excess of 1,000,000 kelvins, much hotter than the surface of the Sun. The sun's corona is much hotter (by a factor from 150 to 450) than the visible surface of the Sun: the photosphere's average temperature is 5800 kelvins compared to the corona's one to three million kelvins. The corona is 10−12 times as dense as the photosphere, and so produces about one-millionth as much visible light. The corona is separated from the photosphere by the relatively shallow chromosphere. The exact mechanism by which the corona is heated is still the subject of some debate, but likely possibilities include induction by the Sun's magnetic field and magnetohydrodynamic waves from below. The outer edges of the Sun's corona are constantly being transported away due to open magnetic flux and hence generating the solar wind. the plasma temperature. It is evident from the equation that the plasma pressure lowers when the plasma temperature decreases with respect to the surrounding regions or when the zone of intense magnetic field empties. The same physical effect renders sunspots apparently dark in the photosphere. is roughly 20 in the corona, with a mean temperature of 1 MK and a density of 1015 particles/m3, and about 10 in the chromosphere, where the temperature is approximately 10kK and the particle density is of the order of 1018 particles/m3, and in practice it can be assumed constant. A new visualisation technique can provide clues to the coronal heating problem. 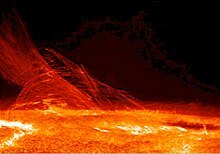 The coronal heating problem in solar physics relates to the question of why the temperature of the Sun's corona is millions of kelvins higher than that of the surface. Several theories have been proposed to explain this phenomenon but it is still challenging to determine which of these is correct. The problem first emerged when Bengt Edlen and Walter Grotrian identified Fe IX and Ca XIV lines in the solar spectrum. This led to the discovery that the emission lines seen during solar eclipses are not caused by an unknown element called "coronium" but known elements at very high stages of ionization. The comparison of the coronal and the photospheric temperatures of 6,000 K, leads to the question of how the 200 times hotter coronal temperature can be maintained. The problem is primarily concerned with how the energy is transported up into the corona and then convert it into heat within a few solar radii. The high temperatures require energy to be carried from the solar interior to the corona by non-thermal processes, because the second law of thermodynamics prevents heat from flowing directly from the solar photosphere (surface), which is at about 5800 K, to the much hotter corona at about 1 to 3 MK (parts of the corona can even reach 10 MK). Between the photosphere and the corona, the thin region through which the temperature increases is known as the transition region. It ranges from only tens to hundreds of kilometers thick. Energy cannot be transferred from the cooler photosphere to the corona by conventional heat transfer as this would violate the second law of thermodynamics. An analogy of this would be a light bulb raising the temperature of the air surrounding it to something greater than its glass surface. Hence, some other manner of energy transfer must be involved in the heating of the corona. The NASA mission Parker Solar Probe is intended to approach the Sun to a distance of approximately 9.5 solar radii to investigate coronal heating and the origin of the solar wind. It has been successfully launched on August 12, 2018 and is currently leaving Earth for the first orbit. Recently, Alfvénic motions have been found in the lower solar atmosphere  and also in the quiet Sun, in coronal holes and in active regions using observations with AIA on board the Solar Dynamics Observatory. These Alfvénic oscillations have significant power, and seem to be connected to the chromospheric Alfvénic oscillations previously reported with the Hinode spacecraft . Solar wind observations with the Wind spacecraft have recently shown evidence to support theories of Alfvén-cyclotron dissipation, leading to local ion heating. Magnetic reconnection is hypothesized to be the mechanism behind solar flares, the largest explosions in the Solar System. Furthermore, the surface of the Sun is covered with millions of small magnetized regions 50–1,000 km across. These small magnetic poles are buffeted and churned by the constant granulation. The magnetic field in the solar corona must undergo nearly constant reconnection to match the motion of this "magnetic carpet", so the energy released by the reconnection is a natural candidate for the coronal heat, perhaps as a series of "microflares" that individually provide very little energy but together account for the required energy. ^ a b Aschwanden, M. J. (2004). Physics of the Solar Corona. An Introduction. Praxis Publishing. ISBN 978-3-540-22321-4. ^ de Ferrer, José Joaquín (1809). "Observations of the eclipse of the sun June 16th 1806 made at Kinderhook in the State of New York". Transactions of the American Philosophical Society. 6: 264. doi:10.2307/1004801. JSTOR 1004801. ^ Espenak, Fred. "Chronology of Discoveries about the Sun". Mr. Eclipse. ^ Vaiana, G. S.; Krieger, A. S.; Timothy, A. F. (1973). "Identification and analysis of structures in the corona from X-ray photography". Solar Physics. 32 (1): 81–116. Bibcode:1973SoPh...32...81V. doi:10.1007/BF00152731. ^ Vaiana, G.S. ; Tucker, W.H. (1974). R. Giacconi; H. Gunsky, eds. "Solar X-Ray Emission in "X-Ray Astronomy"": 169. ^ Vaiana, G S; Rosner, R (1978). "Recent advances in Coronae Physics". Annu. Rev. Astron. Astrophys. 16: 393–428. Bibcode:1978ARA&A..16..393V. doi:10.1146/annurev.aa.16.090178.002141. ^ a b Gibson, E. G. (1973). The Quiet Sun. National Aeronautics and Space Administration, Washington, D.C.
^ "How NASA Revealed Sun's Hottest Secret in 5-Minute Spaceflight". Archived from the original on 2013-01-24. ^ Katsukawa, Yukio; Tsuneta, Saku (2005). "Magnetic Properties at Footpoints of Hot and Cool Loops". The Astrophysical Journal. 621 (1): 498–511. Bibcode:2005ApJ...621..498K. doi:10.1086/427488. ^ Betta, Rita; Orlando, Salvatore; Peres, Giovanni; Serio, Salvatore (1999). "On the Stability of Siphon Flows in Coronal Loops". Space Science Reviews. 87: 133–136. Bibcode:1999SSRv...87..133B. doi:10.1023/A:1005182503751. ^ a b c Giacconi, Riccardo (1992). J. F. Linsky and S.Serio, ed. G.S. Vaiana memorial lecture in Proceedinds of Physics of Solar and Stellar Coronae: G.S. Vaiana Memorial Symposium. Kluwer Academic Publishers-Printed in the Netherlands. pp. 3–19. ISBN 978-0-7923-2346-4. ^ Ofman, Leon (2000). "Source regions of the slow solar wind in coronal streamers". Geophysical Research Letters. 27 (18): 2885–2888. Bibcode:2000GeoRL..27.2885O. doi:10.1029/2000GL000097. ^ Kariyappa, R.; Deluca, E. E.; Saar, S. H.; Golub, L.; Damé, L.; Pevtsov, A. A.; Varghese, B. A. (2011). "Temperature variability in X-ray bright points observed with Hinode/XRT". Astronomy & Astrophysics. 526: A78. Bibcode:2011A&A...526A..78K. doi:10.1051/0004-6361/201014878. ^ Ito, Hiroaki; Tsuneta, Saku; Shiota, Daikou; Tokumaru, Munetoshi; Fujiki, Ken'Ichi (2010). "Is the Polar Region Different from the Quiet Region of the Sun?". The Astrophysical Journal. 719 (1): 131–142. arXiv:1005.3667. Bibcode:2010ApJ...719..131I. doi:10.1088/0004-637X/719/1/131. ^ Del Zanna, G.; Bromage, B. J. I.; Mason, H. E. (2003). "Spectroscopic characteristics of polar plumes". Astronomy & Astrophysics. 398 (2): 743–761. Bibcode:2003A&A...398..743D. doi:10.1051/0004-6361:20021628. ^ Pallavicini, R.; Serio, S.; Vaiana, G. S. (1977). "A survey of soft X-ray limb flare images – The relation between their structure in the corona and other physical parameters". The Astrophysical Journal. 216: 108. Bibcode:1977ApJ...216..108P. doi:10.1086/155452. ^ Golub, L.; Herant, M.; Kalata, K.; Lovas, I.; Nystrom, G.; Pardo, F.; Spiller, E.; Wilczynski, J. (1990). "Sub-arcsecond observations of the solar X-ray corona". Nature. 344 (6269): 842–844. Bibcode:1990Natur.344..842G. doi:10.1038/344842a0. ^ a b Güdel M (2004). "X-ray astronomy of stellar coronae" (PDF). The Astronomy and Astrophysics Review. 12 (2–3): 71–237. arXiv:astro-ph/0406661. Bibcode:2004A&ARv..12...71G. doi:10.1007/s00159-004-0023-2. Archived from the original (PDF) on 2011-08-11. ^ Vaiana, G.S. ; et al. (1981). "Results from an extensive Einstein stellar survey". The Astrophysical Journal. 245: 163. Bibcode:1981ApJ...245..163V. doi:10.1086/158797. ^ Jeffrey, Alan (1969). Magneto-hydrodynamics. UNIVERSITY MATHEMATICAL TEXTS. ^ Mewe, R. (1991). "X-ray spectroscopy of stellar coronae". The Astronomy and Astrophysics Review. 3 (2): 127. Bibcode:1991A&ARv...3..127M. doi:10.1007/BF00873539. ^ a b Spitzer, L. (1962). Physics of fully ionized gas. Interscience tracts of physics and astronomy. ^ a b "2004ESASP.575....2K Page 2". adsbit.harvard.edu. Retrieved 2019-02-28. ^ a b Aschwanden, Markus (2006). Physics of the Solar Corona: An Introduction with Problems and Solutions. Berlin: Springer Science & Business Media. p. 355. ISBN 978-3540307655. ^ Falgarone, Edith; Passot, Thierry (2003). Turbulence and Magnetic Fields in Astrophysics. Berlin: Springer Science & Business Media. p. 28. ISBN 978-3540002741. ^ Ulmshneider, Peter (1997). J.C. Vial; K. Bocchialini; P. Boumier, eds. Heating of Chromospheres and Coronae in Space Solar Physics, Proceedings, Orsay, France. Springer. pp. 77–106. ISBN 978-3-540-64307-4. ^ Malara, F.; Velli, M. (2001). Pål Brekke; Bernhard Fleck; Joseph B. Gurman, eds. Observations and Models of Coronal Heating in Recent Insights into the Physics of the Sun and Heliosphere: Highlights from SOHO and Other Space Missions, Proceedings of IAU Symposium 203. Astronomical Society of the Pacific. pp. 456–466. ISBN 978-1-58381-069-9. ^ Cirtain, J. W.; Golub, L.; Winebarger, A. R.; De Pontieu, B.; Kobayashi, K.; Moore, R. L.; Walsh, R. W.; Korreck, K. E.; Weber, M.; McCauley, P.; Title, A.; Kuzin, S.; Deforest, C. E. (2013). "Energy release in the solar corona from spatially resolved magnetic braids". Nature. 493 (7433): 501–503. Bibcode:2013Natur.493..501C. doi:10.1038/nature11772. PMID 23344359. ^ Alfvén, Hannes (1947). "Magneto hydrodynamic waves, and the heating of the solar corona". MNRAS. 107 (2): 211–219. Bibcode:1947MNRAS.107..211A. doi:10.1093/mnras/107.2.211. ^ "Alfven Waves – Our Sun Is Doing The Magnetic Twist". read on Jan 6 2011. Archived from the original on 2011-07-23. ^ Jess, DB; Mathioudakis, M; Erdélyi, R; Crockett, PJ; Keenan, FP; Christian, DJ (2009). "Alfvén Waves in the Lower Solar Atmosphere". Science. 323 (5921): 1582–1585. arXiv:0903.3546. Bibcode:2009Sci...323.1582J. doi:10.1126/science.1168680. hdl:10211.3/172550. PMID 19299614. ^ McIntosh, S. W.; de Pontieu, B.; Carlsson, M.; Hansteen, V. H.; The Sdo; Aia Mission Team (2010). "Ubiquitous Alfvenic Motions in Quiet Sun, Coronal Hole and Active Region Corona". American Geophysical Union, Fall Meeting. abstract #SH14A-01. ^ "Sun's Magnetic Secret Revealed". read on Jan 6 2011. Archived from the original on 2010-12-24. ^ Kasper, J.C.; et al. (December 2008). "Hot Solar-Wind Helium: Direct Evidence for Local Heating by Alfven-Cyclotron Dissipation". Phys. Rev. Lett. 101 (26): 261103. Bibcode:2008PhRvL.101z1103K. doi:10.1103/PhysRevLett.101.261103. PMID 19113766. ^ Priest, Eric (1982). Solar Magneto-hydrodynamics. D.Reidel Publishing Company, Dordrecht, Holland. ISBN 978-90-277-1833-4. ^ Patsourakos, S.; Vial, J.-C. (2002). "Intermittent behavior in the transition region and the low corona of the quiet Sun". Astronomy and Astrophysics. 385 (3): 1073–1077. Bibcode:2002A&A...385.1073P. doi:10.1051/0004-6361:20020151. ^ "Mystery of Sun's hot outer atmosphere 'solved' – Rediff.com News". Rediff.com. 2011-01-07. Archived from the original on 2012-04-15. Retrieved 2012-05-21. ^ De Pontieu, B; McIntosh, SW; Carlsson, M; Hansteen, VH; Tarbell, TD; Boerner, P; Martinez-Sykora, J; Schrijver, CJ; Title, AM (2011). "The Origins of Hot Plasma in the Solar Corona". Science. 331 (6013): 55–58. Bibcode:2011Sci...331...55D. doi:10.1126/science.1197738. PMID 21212351.